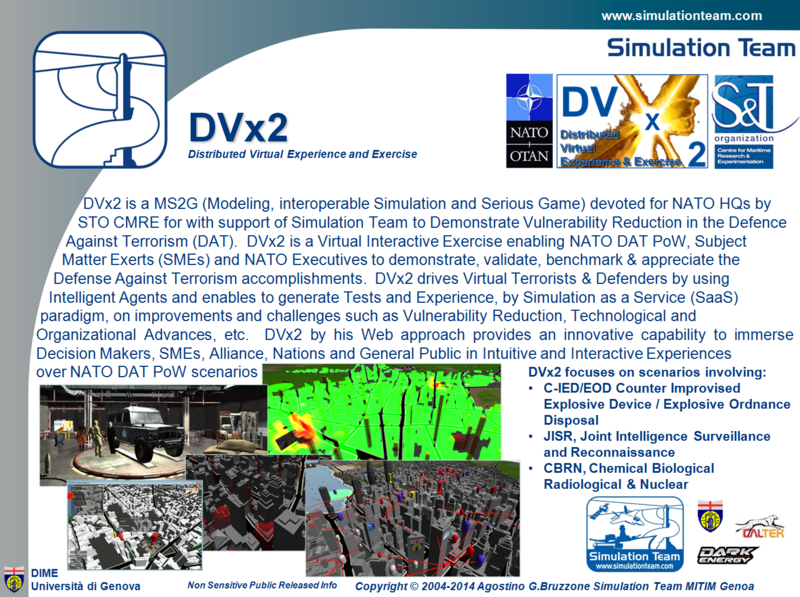 DVx2 is a MS2G (Modeling, interoperable Simulation and Serious Game) devoted for NATO HQs by STO CMRE for with support of Simulation Team to Demonstrate Vulnerability Reduction in the Defence Against Terrorism (DAT). DVx2 is a Virtual Interactive Exercise enabling NATO DAT PoW, Subject Matter Exerts (SMEs) and NATO Executives to demonstrate, validate, benchmark & appreciate the Defense Against Terrorism accomplishments. DVx2 drives Virtual Terrorists & Defenders by using Intelligent Agents and enables to generate Tests and Experience, by Simulation as a Service (SaaS) paradigm, on improvements and challenges such as Vulnerability Reduction, Technological and Organizational Advances, etc. DVx2 by his Web approach provides an innovative capability to immerse Decision Makers, SMEs, Alliance, Nations and General Public in Intuitive and Interactive Experiences over NATO DAT PoW scenarios.